1. a narrow rim of loosened keratin overhanging the periphery of a circumscribed skin lesion, attached to the normal surrounding skin. 2. an irregular jagged line dividing the anterior surface of the iris into two regions, the pupillary zone and the ciliary zone. Biett's collarette a type of papular syphilid in which the central papule is surrounded by a ring of scales. 1. The sinuous, scalloped line in the iris that divides the central pupillary zone from the peripheral ciliary zone and marks the embryonic site of the atrophied minor vascular circle of the iris. 2. Brittle scales encircling eyelashes in staphylococcal blepharitis. 2. an irregular jagged line dividing the anterior surface of the iris into two regions. 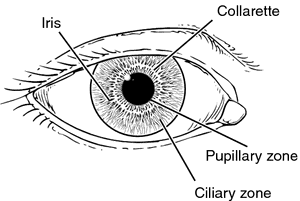 Line separating the pupillary zone and the ciliary zone which can be seen on the anterior surface of the iris. In the normal iris it is an irregular circular line lying about 1.5 mm from the pupillary margin (Fig. C13). See minor arterial circle of the iris; crypts of Fuchs. a small collar; see epidermal collarette, iris collarette. A low-power view shows a polypoid mass with a collarette of epithelium, centrally ulcerated. Another condition that accompanies PPM is the presence of sheets that move away from the iris collarette and remain freely floating in the anterior chamber without adhering to any other structure. The collarette is a main landmark within the iris and one of our most important structures in the entire body. Biett's collarette is a pathognomonic sign for secondary syphilis. Ventral face, circular shell with circular pseudostoma, centered, with collarette at the aperture. When located on the skin they have a fine scale, like a collarette on the surface and on the mucous membranes, and they usually erode. PG may have polypoid appearance and often develop a stalk or collarette of scale at the base. This displacement was more marked dorsally where the iris billowed forward more prominently at the collarette region than at the iris root or pupillary margin (Figs 1 and 2). Parade-goers carried the orange collarette, a small V-shaped sash worn around the neck. Each lesion was surrounded by erythema and collarette scaling. Chamber conical, neck absent, wall surface smooth, collarette perforated, sharp margin bearing reticulated carina not perpendicular to axis of vesicle, concave base smooth. The legs are positioned directly at six, with the hips toward the collarette and the feet at the ciliary border with the knees approximately mid- way.